Home Design & Decorate Decorating Ideas "So Spectacularly Ill-judged That You Almost Long For Libeskind's Earnestness"
"So Spectacularly Ill-judged That You Almost Long For Libeskind's Earnestness"
Opinion: the refurbishment of London’s Imperial War Museum by Norman Foster is a “botched” job, but it’s hardly surprising given the UK’s strange attitude to its own history, says Owen Hatherley. The 100th anniversary of the beginning of the First World War this autumn was always bound to lead to some bad architecture. However, Daniel Libeskind has not used slopes and titanium to act as a synechdoche for trenchfoot or shelling on some Centenary War Experience in the Flanders Fields this time. 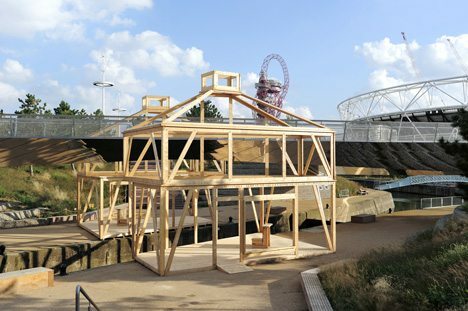 The very 1990s memorialising architecture that he and other deconstructivists specialised in is not terribly fashionable in 2014. The favoured model of memorial space now is much closer to something like Carmody Groake’s 7/7 Memorial in London, with its sober steel stelae, than the ambitious clashing forms of Libeskind’s war museum in Dresden or Jewish Museum in Berlin, cheapened by their overuse for more prosaic functions like students’ unions and luxury flats. But while Libeskind’s Imperial War Museum North in Manchester now seems the product of a bygone New Labour era, the new refurbishment of the original Imperial War Museum in London by Norman Foster is so spectacularly ill-judged that you almost long for Libeskind’s earnestness – at least he gave the impression of actually caring about the subject matter. But exploring the refurbed museum is, at least, an instructive journey around a country’s massively confused sense of its own history. The very notion of an Imperial War Museum may give a bit of a shudder in certain quarters; it’s strange it was kept as a name, when, for instance, the Imperial War Graves Commission – an influential sponsor of original classical architects like Charles Holden and Edwin Lutyens – renamed itself the Commonwealth War Graves Commission over half a century ago. The building itself has a deeply uncomfortable history, intriguingly so – beneath its sober portico and dome was previously Bethlehem Hospital, whose nickname, Bedlam, became a synonym for poorly run mental hospitals and for general chaos way beyond the corner of south London where it still sits, in attractive grounds furnished with rockets, memorial gardens and fragments of the Berlin Wall. Inside, there’s still more than a whiff of Bedlam about it. In the obligatory atrium, planes are suspended and missiles point up at a jagged suspended ceiling, barely concealing an 1980s glass dome. A baffling system of circulation leads you constantly, pointlessly up and down, with levels that look like they connect leading nowhere, and inclined walls supporting it all. The glassy, airy business park atrium has long been Foster’s model for almost everything – from a City Academy to the British Museum to the Reichstag – but here the elegance and clarity Foster brings, at best, to this now rather tired type has disappeared in a mess of clumsy angles. I’m quite sure Foster will have justified this as a reaction to perhaps the most important thing about the Imperial War Museum – its collection of paintings and sculptures, whose cross-section of British artists responding to the shock and horror of their wartime experiences made, and still makes it one of the best (and least used) modern art galleries in Britain. The most famous of these are Vorticist works by Wyndham Lewis, William Roberts and David Bomberg. Maybe those jagged roofs are a “reference” to Lewis’ A Battery Shelled, a panoramic landscape of abstracted destruction now translated into faceted metal suspended ceilings. If so, the metaphor is rather hard to take as the building’s much more makeshift – if much less counter-intuitive – previous refurbishment keeps poking out in the corners. The main atrium was always a faintly triumphalist collection of random big weapons under a big and cheap dome, and it is still that, except lots of pointless bits of circulation have been crammed into it to make it feel both triumphalist and claustrophobic. Curiously, one of the sillier exhibits, where you go through the “real” sights and smells of a trench has been discontinued, as if aware that it was rather distasteful. In the building as a whole, the Libeskind defence of angular architecture as a means of representing the real disorientation of conflict doesn’t stand up: it just looks as if the architects haven’t particularly thought the space out properly. Arbitrary patterns lead their way up the atrium to something called the Lord Ashcroft Gallery. That confusion is constantly reflected in the exhibits. The art collection aside, the museum has been aimed at children for some time, but the infantilisation now feels especially extreme. Little “post-it notes” appear next to every exhibit on the floor that outlines Britain’s post-1945 military history, sketching out in the minimum of words with the minimum of length the minimum of information, as jollily as possible. Even then, a cursory wander round can uncover outright inaccuracies (eg, the Korean War as a battle between the “democratic” south and the dictatorial north, when the south didn’t hold fair elections until several decades after the conflict). Or, more unsurprisingly, refusals to confront anything too uncomfortable – the Troubles in Northern Ireland are presented as if the British Army was a baffled onlooker rather than an active participant, but all ending happily when Ian Paisley and Martin McGuinness open an Ikea together. Given that there’s actually an exhibit specifically for children – a show about spying, based around one of the Horrible Histories books – it’s unclear whether this isn’t actually a matter of talking down to adults. All is explained, as always, in the gift shop. After you’ve gone pointlessly up and down a few flights of steps, there are two distinct shops. One is “serious” and sells history books and a new catalogue with an introduction by the Duke of Cambridge; the other is a great big emporium devoted to the austerity nostalgia that Britain has been stuffing its face with since 2008, a place to binge yourself on Keep Calm and Carry On. The exhibits come across like a three-dimensional version of one of those books that tell you with big pictures and minimal text what it was like fighting the bosches and eating spam – narcissistic wallowing in fake poverty and barely coherent history as a way of avoiding any thought of how to drag ourselves out of our current, needless and far less egalitarian version of austerity. The “rationing experience”, organic wartime cuisine to be cooked in the Aga of a ruthlessly scrubbed ex-council flat. There’s probably an app for it. The perpetuation of this nonsense is the real function that Foster had to design for, so it’s no wonder they botched it. Owen Hatherley is a critic and author, focussing on architecture, politics and culture. His books include Militant Modernism (2009), A Guide to the New Ruins of Great Britain (2010), and A New Kind of Bleak: Journeys Through urban Britain (2012).